A suicide bomber struck the Afghan government’s Rural Rehabilitation and Development Ministry in Kabul earlier today. 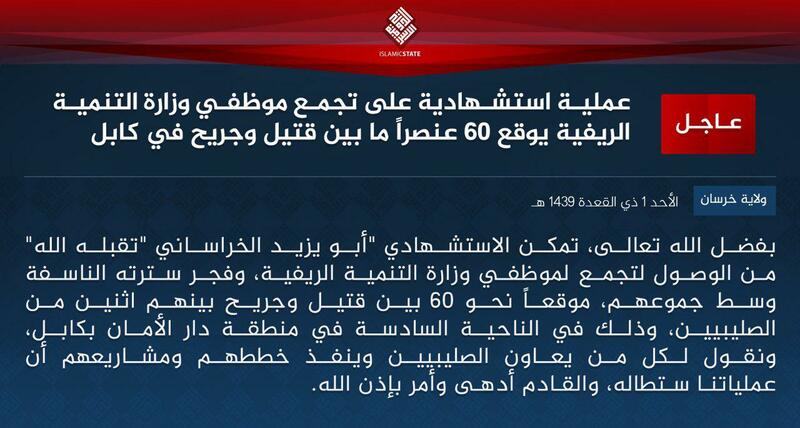 The Islamic State quickly claimed responsibility for the attack via its Amaq News Agency, which released a one-page report on the bombing. The so-called caliphate subsequently released another claim of responsibility as well. Amaq says that a “martyrdom” operative detonated his explosive vest as the ministry’s employees were leaving the building, resulting in 60 casualties. Initial casualty counts reported by the press, including RadioFreeEurope/Radio Liberty, indicate that at least seven people were killed and 15 more wounded. Amaq highlights the alleged presence of European and American “experts” at the ministry, which supposedly operates under the direction of international authorities, and claims that some of the casualties from today’s assault were French. The Islamic State’s Khorasan arm attacked the same ministry last month. On June 11, dozens of people were killed or injured when another suicide bomber detonated himself at a gate outside of the Rural Rehabilitation and Development Ministry’s building. Why do we still bunch people up? When are we going to learn to limit targeting opportunities for the terrorists? A few million investment in Afghanistan should probably be enough and probably ~$50 million (just guessing) of pre-fabricated and reconfigurable portable blast walls would be enough world-wide! What a bunch of no-account losers these Isis and Taliban are! Next they will bomb a mayonnaise factory, becouse they prefer ketchup, or whatever! It speaks volumes about their plans for the future. Now WE ARE going to talk with them? You would never get me to go to my own death in that way. Does ANYONE actually believe they have ANY good intentions? Who could be so unbelievably gullible?